You started your trip in Costa Rica at the resort Hacienda AltaGracia. What made you chose Uvita in Southern Costa Rica once you left the resort? We chose Uvita because the beach towns in Northern Costa Rica are pretty busy and touristy. Uvita is a relatively new tourist area in Costa Rica, and is much quieter, which is what I wanted. What made you decide to stay at the Elan at Ballena Beach condominiums? Uvita's beach is part of a national park, which means that development is not allowed on the beach - an important thing for potential visitors to know. All the hotels and rentals are built away from the beach in the rainforest, with a walk down the beach. We chose our apartment - and paid the premium - to be closest to the beach, since we felt it would be much more convenient with the babies. Most of the hotels in Uvita are up on the mountainside - still close to the beach, but a 10 minute drive on a dirt road. Elan is the only development in the area with a private beach that can be directly accessed via a flat, easy walking trail. It takes only three minutes to get from the condo to the beach. Also, although the other accommodations in the area have stunning rainforest views, being up in the mountainside like that can be scary with crawling babies and walking toddlers. We went to one hotel in the area for lunch which had a straight drop off. Even with fences, there were gaps where the babies could get through. It would have been terrifying to stay there for a week because would have been constantly worried about the girls falling off a cliff. The apartment is part of a brand new gated condo complex, with a security guard. The complex has three pools, which were amazing. It had a full-on kids' pool with a super shallow area, so the girls could lie on their tummies and crawl around in the pool. The Elan also has a private beach, with lifeguard. It was very quiet, never more than 10 people. 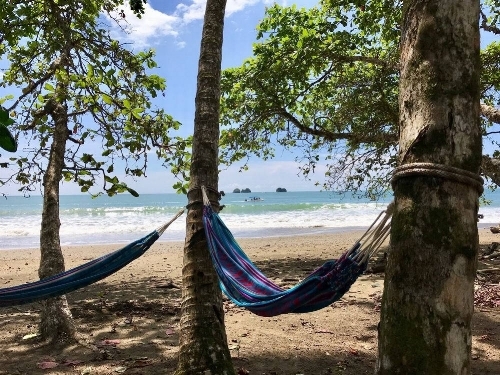 (Editor's Note: The Elan at Bellena Beach has an on-site concierge service that can book tours such as zip-lining, surfing lessons, sport fishing, whale and dolphin tours, snorkeling or diving expeditions, bird-watching, hiking tours, mangrove kayaking, and Corcavado National Park or Manuel Antonio National Park day trips. It can also assist with in-country transportation bookings. Did The Elan at Ballena Beach come fully furnished for the babies? Our unit had two pack and plays, which worked for the girls. 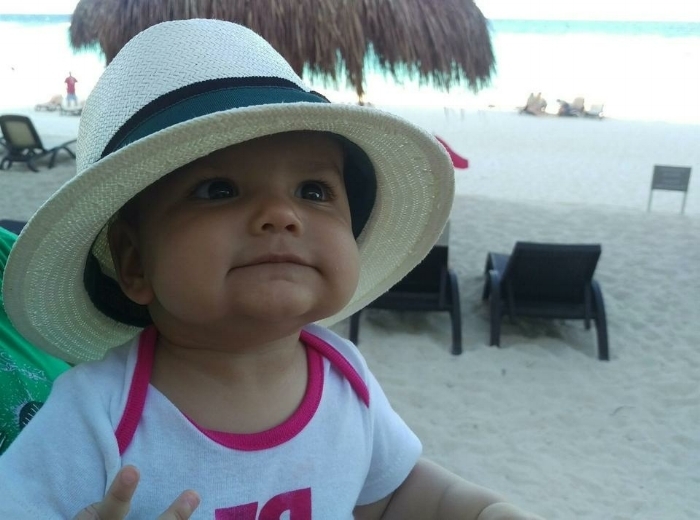 The babies weren't as comfortable in the pack and plays as they were in the cribs at Hacienda AltaGracia, though the pack and plays were safer, since there was no risk of them crawling out. There were no high chairs, though the complex is new, so I'd put that in the reviews in the hopes of encouraging them to get some. We brought lobster highchairs on our trip, and attached them to the counter top in the kitchen. There were no major safety hazards in the apartment, though there was a lot of nice white furniture ... a LOT of white, but uhh (laughs) ... we did ok. The feel is very minimalist modern, which was great in the sense that there's very little for them to touch (laughs again). You had a two bedroom apartment. Did you put the girls in the second bedroom? We didn't, because the blinds aren't blackout blinds. They actually let quite a lot of light in. So we ended up sleeping the girls in one of the massive en suite bathrooms, which has plenty of space for two pack and plays. And because the apartment had two and a half baths, we still had someplace to shower and go to the bathroom when the girls were asleep. I know a lot of parents put their babies in hotel bathrooms when on vacation. How did the girls sleep? The girls do sleep through the night at home for the most part, which is relatively new thing... There were some wake ups on the trip, but I think they would have slept the same wherever they were, since they were in strange surroundings. Not moving around from spot to spot helped with sleep. The girls got used to not being in their cribs at home, and adjusted after a night or two. Since it was an apartment, did you have to do your own cleaning? No. There was daily cleaning service, just like a resort or hotel. Did you have to do your own cooking at the apartment? We did. But the grocery store was super close, about 10 minutes away. For us, the girls still take bottles, which we need to warm up. So having a kitchen is ideal. And because we find that we only have the energy for one meal out per day with the girls, cooking worked out great for us. Getting groceries and cooking ourselves also meant we saved on meals and were able to splurge more on accommodations that really enhanced our experience. So it worked out great. We really didn't even need to bring baby food with us from back home, since the local grocery store had everything you'd need. Although we had the kitchen, we ordered takeout for dinner a fair amount. Uvita has amazing restaurants at quite affordable prices. The food was delicious! What did you do with the girls each day? It gets hot mid-day in Uvita - around 35 degrees Celsius (95 degrees Fahrenheit) when we visited in March. So we didn't take the girls out during the hottest times of the day. We went out to lunch twice, but found it was a bit too hot for them, so after that, we just stayed in. The apartment had air conditioning, so we would keep them inside. So what did you do inside? We brought toys with us, so the girls played. Plus they are at an age where exploring the apartment itself is an adventure - crawling on and into things. So they were happy. And the babies are still doing two naps? They are, so they are up from 11:30am-1:30pm. Then they nap again until 3:30. After their second nap we would get up and swim. The pool was shaded, so we could go in the afternoon. How was the private beach? As I mentioned, it was always quiet, with never more than 10 people. And the water was so calm, especially during low tide. There's no undercurrent, unlike many beaches in Costa Rica and Mexico, which are not great for swimming. The complex has free boogie boards and the water was good enough that you could body surf at high tide, but during low tide we played in the waves with the girls - holding them - and they totally loved it. That said, unless your little ones are really into playing in the sand, I'd say that the pool is where you'll end up spending most of your time. Especially because the babies are still putting everything in their mouths. They probably ate ten pounds of dirt each while at the beach. They just sat there and put copious amounts of mud in their face, and there were small stones mixed in. So you have to pretty "on" when you're at the beach. Plus it's such a pain to clean it all after - though the complex had outdoor showers to rinse everyone off before going back inside. What did you and Daryl do when the girls were napping? Relaxed. We laid in hammocks, walked along the beach, relaxed in the apartment, went to the pool by ourselves. We'd take turns staying in the apartment and watching the monitor while the other person went out. We also went into town occasionally - it's a super quick, 5 minute drive. We could grab a latte, get lunch or groceries. You mentioned that it was a quick drive into town. Did you have a car? Yes, we rented a car from the airport for our trip. Driving wasn't a problem in Costa Rica And the apartment has free parking. (Editor's note: For more on driving in Costa Rica, read The Littlest Passport's other interview with Alana about driving to Hacienda AltaGracia resort). Would you recommend the Elan at Ballena Beach to folks traveling with little ones? Yes, if you can afford it. We had originally planned to stay here with my parents, and the apartment would have been great (and a good value) for extended families, since it was a two bedroom with two and a half baths. The bedrooms are on opposite ends of the unit, giving each couple some privacy - and meaning the people in the second bedroom wouldn't hear a baby crying. (Editor's note: A three bedroom unit is also available). 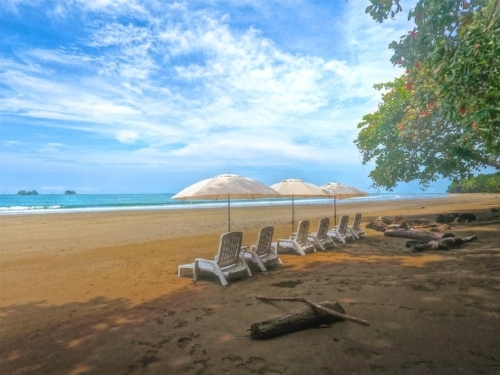 The area is a good choice for a low-key beach vacation away from the more touristy areas of Costa Rica, and the condo's private beach is stunning. Uvita gets quite hot, so you'll definitely need accommodations with air conditioning if traveling with babies or toddlers. A two-bedroom, 2.5 bath apartment at The Elan at Ballena Beach starts at $280 USD per night. All information is current at time of publication. We recommend confirming all information with the hotel prior to booking. The Littlest Passport did not receive promotional consideration for this article.